In a previous post, the nifti-1 file format was presented. An update of this format has recently been produced by the Data Format Working Group (dfwg). The updated version retains generally the same amount of information as the previous, with the crucial difference that it allows far more datapoints in each dimension, thus permitting that the same overall file structure is used to store, for instance, surface-based scalar data, or large connectivity matrices. Neither of these had originally been intended at the time the analyze or the nifti-1 formats were developed. While packages as FreeSurfer developed their own formats for surface-based scalar data, a more general solution was still pending. Users who participated of the transition from analyze to nifti-1 may remember that the same libraries used to read analyze would read nifti, perhaps with a few minor difficulties, but the bulk of the actual data would be read by most analyze-compliant applications. This was possible because a large part of the relevant information in the header was kept exactly in the same position counted from the beginning of the file. An application could read information at a given byte position and locate it without error, or without finding something else. This time things are different. While a large degree of compatibility exists, this compatibility helps more the developer than the end user. If before, an application made to read only analyze could read nifti-1, this time an application made to read nifti-1 will not read nifti-2 without a few, even if minor, changes to the application source code. To put in other words, the new version of the format is not bitwise compatible with the previous one. The reasons for this “almost compatibility” will become clear below. The limitation that became evident with the new uses found for the nifti format refer particularly to the maximum number of points (e.g., voxels) in each dimension. This limitation stems from the field short dim, which allows only 2 bytes (16 bits) for each dimension; since only positive values are accepted (short is signed), this imposes a cap: no more than 215-1 = 32767 voxels per dimension. In the nifti-2 format, this was replaced by int64_t dim, which guarantees 8 bytes (64 bits) per dimension, and so, a much larger number of points per dimension, that is, 263-1 = 9,223,372,036,854,775,807. Another change is that the fields were reordered, which is an improvement over the nifti-1: the magic string, for instance, is now at the beginning of the file, which helps testing what kind of file it is. All constraints that were imposed on the nifti-1 to allow compatibility with the analyze were finally dropped. At the far end of the header, a field with 15 bytes was included for padding the header to a total size of 540, and to ensure 16-byte alignment after the 4 final bytes that indicate extra information are included. int sizeof_hdr 0B 4B Size of the header. Must be 540 (bytes). char magic 4B 8B Magic string, defining a valid signature. int16_t data_type 12B 2B Data type. int16_t bitpix 14B 2B Number of bits per voxel. int64_t dim 16B 64B Data array dimensions. double intent_p1 80B 8B 1st intent parameter. double intent_p2 88B 8B 2nd intent parameter. double intent_p3 96B 8B 3rd intent parameter. double pixdim 104B 64B Grid spacings (unit per dimension). int64_t vox_offset 168B 8B Offset into a .nii file. double scl_slope 176B 8B Data scaling, slope. double scl_inter 184B 8B Data scaling, offset. double cal_max 192B 8B Maximum display intensity. double cal_min 200B 8B Minimum display intensity. double slice_duration 208B 8B Time for one slice. double toffset 216B 8B Time axis shift. int64_t slice_start 224B 8B First slice index. int64_t slice_end 232B 8B Last slice index. char descrip 240B 80B Any text. char aux_file 320B 24B Auxiliary filename. int qform_code 344B 4B Use the quaternion fields. int sform_code 348B 4B Use of the affine fields. double quatern_b 352B 8B Quaternion b parameter. double quatern_c 360B 8B Quaternion c parameter. double quatern_d 368B 8B Quaternion d parameter. double qoffset_x 376B 8B Quaternion x shift. double qoffset_y 384B 8B Quaternion y shift. double qoffset_z 392B 8B Quaternion z shift. double srow_x 400B 32B 1st row affine transform. double srow_y 432B 32B 2nd row affine transform. double srow_z 464B 32B 3rd row affine transform. int slice_code 496B 4B Slice timing order. int xyzt_units 500B 4B Units of pixdim[1..4]. int intent_code 504B 4B nifti intent. char intent_name 508B 16B Name or meaning of the data. char dim_info 524B 1B Encoding directions. char unused_str 525B 15B Unused, to be padded with with zeroes. For the developer writing input/output functions to handle nifti files, a simple check can be used to test the version and the endianness of the file: the first four bytes are read (int sizeof_hdr): if equal to 348, then it is a nifti-1 file; if equal to 540, then it is a nifti-2 file. If equal to neither, then swap the bytes, as if reading in the non-native endianness, and repeat the test; if this time the size of the header is found as 348 or 540, the version is determined, and this also implies that all bytes in the file need to be swapped to match the endianness of the current architecture. If, however, the first four bytes do not contain 348 or 540 in either endianness, then it is not a valid nifti file. Once the version and the endianness have been determined, if it is a nifti-1 file, jump to byte 344 and check if the content is 'ni1' (or '6E 69 31 00' in hexadecimal), indicating a pair .hdr/.img, or if it is 'n+1' ('6E 2B 31 00'), indicating a single .nii file. If, however, it is a nifti-2 file, just read the next 8 bytes and check if the content is 'n+2' ('6E 2B 32 00') followed by '0D 0A 1A 0A' (hex). Just like the nifti-1, the four bytes after the end of the nifti-2 header are used to indicate extensions and more information. Thus, the actual data begins after the byte 544. See the post on the nifti-1 for details. The cifti-2 file format (used extensively by the Human Connectome Project) is built on top of the nifti-2 format, and uses this extra information. The official definition of the nifti-2 format is available as a c header file (nifti2.h) here and mirrored here. The Neuroimaging Informatics Technology Initiative (nifti) file format was envisioned about a decade ago as a replacement to the then widespread, yet problematic, analyze 7.5 file format. The main problem with the previous format was perhaps the lack of adequate information about orientation in space, such that the stored data could not be unambiguously interpreted. Although the file was used by many different imaging software, the lack of adequate information on orientation obliged some, most notably spm, to include, for every analyze file, an accompanying file describing the orientation, such as a file with extension .mat. The new format was defined in two meetings of the so called Data Format Working Group (dfwg) at the National Institutes of Health (nih), one in 31 March and another in 02 September of 2003. Representatives of some of the most popular neuroimaging software agreed upon a format that would include new information, and upon using the new format, either natively, or have it as an option to import and export. Perhaps the most visible consequence of the lack of orientation information was the then reigning confusion between left and right sides of brain images during the years in which the analyze format was dominant. It was by this time that researchers became used to describe an image as being in “neurological” or in “radiological” convention. These terms have always been inadequate because, in the absence of orientation information, no two pieces of software necessarily would have to display the same file with the same side of the brain in the same side of the screen. A file could be shown in “neurological” orientation in one software, but in radiological orientation in another, to the dismay of an unaware user. Moreover, although there is indeed a convention adopted by virtually all manufacturers of radiological equipment to show the left side of the patient on the right side of the observer, as if the patient were being observed from face-to-face or, if lying supine, from the feet, it is not known whether reputable neurologists ever actually convened to create a “neurological” convention that would be just the opposite of the radiological. The way as radiological exams are normally shown reflects the reality of the medical examination, in which the physician commonly approaches the patient in the bed from the direction of the feet (usually there is a wall behind the bed), and tend to stay face-to-face most of the time. Although the neurological examination does indeed include a few manoeuvres performed at the back, for most of the time, even in the more specialised semiotics, the physician stays at the front. The nifti format obviated all these issues, rendering these terms obsolete. Software can now mark the left or the right side correctly, sometimes giving the option of showing it flipped to better adapt to the user personal orientation preference. A single image stored in the analyze 7.5 format requires two files: a header, with extension .hdr, to store meta-information, and the actual data, with extension .img. In order to keep compatibility with the previous format, data stored in nifti format also uses a pair of files, .hdr/.img. Care was taken so that the internal structure of the nifti format would be mostly compatible with the structure of the analyze format. However, the new format added some clever improvements. Work with a pair of files for each image as in the .hdr/.img, rather than just one, is not only inconvenient, but it is also error prone, as one might easily forget (or not know) that the data of interest is actually split across more than one file. To address this issue, the nifti format also allows for storage as a single file, with extension .nii. Single file or pair of files are not the only possible presentations, though. It is very common for images to have large areas of solid background, or files describing masks and regions of interest containing just a few unique values that appear repeated many times. Files like these occupy large space in the disk, but with little actual information content. This is the perfect case where compression can achieve excellent results. Indeed, both nifti and analyze files can be compressed. The deflate algorithm (used, e.g., by gzip) can operate in streams, allowing compression and decompression on-the-fly. The compressed versions have the .gz extension appended: .nii.gz (single file) or .hdr/.img.gz (pair of files, either nifti or analyze). In the nifti format, the first three dimensions are reserved to define the three spatial dimensions — x, y and z —, while the fourth dimension is reserved to define the time points — t. The remaining dimensions, from fifth to seventh, are for other uses. The fifth dimension, however, can still have some predefined uses, such as to store voxel-specific distributional parameters or to hold vector-based data. In order to keep compatibility with the analyze format, the size of the nifti header was maintained at 348 bytes as in the old format. Some fields were reused, some were preserved, but ignored, and some were entirely overwritten. The table below shows each of the fields, their sizes, and a brief description. More details on how each field should be interpreted are provided further below. int sizeof_hdr 0B 4B Size of the header. Must be 348 (bytes). char data_type 4B 10B Not used; compatibility with analyze. char db_name 14B 18B Not used; compatibility with analyze. int extents 32B 4B Not used; compatibility with analyze. short session_error 36B 2B Not used; compatibility with analyze. char regular 38B 1B Not used; compatibility with analyze. char dim_info 39B 1B Encoding directions (phase, frequency, slice). short dim 40B 16B Data array dimensions. float intent_p1 56B 4B 1st intent parameter. float intent_p2 60B 4B 2nd intent parameter. float intent_p3 64B 4B 3rd intent parameter. short intent_code 68B 2B nifti intent. short datatype 70B 2B Data type. short bitpix 72B 2B Number of bits per voxel. short slice_start 74B 2B First slice index. float pixdim 76B 32B Grid spacings (unit per dimension). float vox_offset 108B 4B Offset into a .nii file. float scl_slope 112B 4B Data scaling, slope. float scl_inter 116B 4B Data scaling, offset. short slice_end 120B 2B Last slice index. char slice_code 122B 1B Slice timing order. char xyzt_units 123B 1B Units of pixdim[1..4]. float cal_max 124B 4B Maximum display intensity. float cal_min 128B 4B Minimum display intensity. float slice_duration 132B 4B Time for one slice. float toffset 136B 4B Time axis shift. int glmax 140B 4B Not used; compatibility with analyze. int glmin 144B 4B Not used; compatibility with analyze. char descrip 148B 80B Any text. char aux_file 228B 24B Auxiliary filename. short qform_code 252B 2B Use the quaternion fields. short sform_code 254B 2B Use of the affine fields. float quatern_b 256B 4B Quaternion b parameter. float quatern_c 260B 4B Quaternion c parameter. float quatern_d 264B 4B Quaternion d parameter. float qoffset_x 268B 4B Quaternion x shift. float qoffset_y 272B 4B Quaternion y shift. float qoffset_z 276B 4B Quaternion z shift. float srow_y 296B 16B 2nd row affine transform. float srow_z 312B 16B 3rd row affine transform. char intent_name 328B 16B Name or meaning of the data. char magic 344B 4B Magic string. Each of these fields is described in mode detail below, in the order as they appear in the header. The field int sizeof_hdr stores the size of the header. It must be 348 for a nifti or analyze format. The field char dim_info stores, in just one byte, the frequency encoding direction (1, 2 or 3), the phase encoding direction (1, 2 or 3), and the direction in which the volume was sliced during the acquisition (1, 2 or 3). For spiral sequences, frequency and phase encoding are both set as 0. The reason to collapse all this information in just one byte was to save space. See also the fields short slice_start, short slice_end, char slice_code and float slice_duration. The field short dim contains the size of the image array. The first element (dim) contains the number of dimensions (1-7). If dim is not in this interval, the data is assumed to have opposite endianness and so, should be byte-swapped (the nifti standard does not specify a specific field for endianness, but encourages the use of dim for this purpose). The dimensions 1, 2 and 3 are assumed to refer to space (x, y, z), the 4th dimension is assumed to refer to time, and the remaining dimensions, 5, 6 and 7, can be anything else. The value dim[i] is a positive integer representing the length of the i-th dimension. * Note: For the distribution, when p1=1, it is a “half-normal” distribution; when p1=2, it is a Rayleigh distribution; and when p1=3, it is a Maxwell-Boltzmann distribution. Other intent codes are available to indicate that the file contains data that is not of statistical nature. Label 1002 Indices of a set of labels, which may be indicated in aux_file. NeuroName 1003 Indices in the NeuroNames set of labels. Generic matrix 1004 For a MxN matrix in the 5th dimension, row major. p1 = M, p2 = N (integers as float); dim = M*N.
Symmetric matrix 1005 For a symmetric NxN matrix in the 5th dimension, row major, lower matrix. p1 = N (integer as float); dim = N*(N+1)/2. Displacement vector 1006 Vector per voxel, stored in the 5th dimension. Vector 1007 As above, vector per voxel, stored in the 5th dimension. Point set 1008 Points in the space, in the 5th dimension. dim = number of points; dim=dim=1; intent_name may be used to indicate modality. Triangle 1009 Indices of points in space, in the 5th dimension. dim = number of triangles. Quaternion 1010 Quaternion in the 5th dimension. Dimless 1011 Nothing. The intent may be in intent_name. Time series 2001 Each voxel contains a time series. Node index 2002 Each voxel is an index of a surface dataset. rgb 2003 rgb triplet in the 5th dimension. dim = 5, dim has the number of entries, dim[2:4] = 1, dim = 3.
rgba 2004 rgba quadruplet in the 5th dimension. dim = 5, dim has the number of entries, dim[2:4] = 1, dim = 4. Shape 2005 Value at each location is a shape parameter, such as a curvature. The intent parameters are stored in the fields float intent_p1, float intent_p2 and float intent_p3. Alternatively, if the parameters are different for each voxel, they should be stored in the 5th dimension of the file. A human readable intent name can be stored in the field char intent_name, which may help to explain the intention of the data when it cannot or is not coded with any of the intent codes and parameters above. The field short bitpix holds the information of the number of bits per voxel. The value must match the type determined by datatype as shown above. The fields short slice_start and short slice_end inform respectively which are the first the last slices that correspond to the actual mri acquisition. Slices present in the image that are outside this range are treated as padded slices (for instance, containing zeroes). The field float slice_duration indicates the amount of time needed to acquire a single slice. Having this information in a separate field allows to correctly store images of experiments in which slice_duration*dim[slice_dim] is smaller than the value stored in pixdim, usually the repetition time (tr). Slice codes to specify slice acquisition timings. 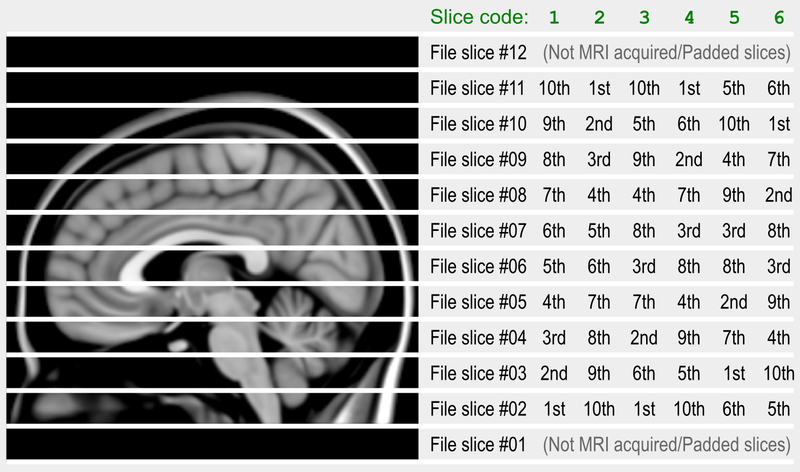 In this example, slice_start = 2 and slice_end = 11, indicating that slices #01 and #12 stored in the file have not been truly acquired with MRI, but instead, were padded to the file. The field slice_duration specifies how long it took to acquire each slice. The dimension that corresponds to the slice acquisition (in this case dim, z) is encoded in the field dim_info. The dimension for each voxel is stored in the field float pixdim, and each element match its respective in short dim. The value in float pixdim, however, has a special meaning, discussed below; it should always be -1 or 1. The units of measurement for the first 4 dimensions are specified in the field xyzt_units, discussed below. The field int vox_offset indicates, for single files (.nii), the byte offset before the imaging data starts. For compatibility with older software, possible values are multiples of 16, and the minimum value is 352 (the smallest multiple of 16 that is larger than 348). For file pairs (.hdr/.img), this should be set as zero if no information other than image data itself is to be stored in the .img (most common), but it can also be larger than zero, allowing for user-defined extra-information to be prepended into the .img, such as a dicom header. In this case, however, the rule of being a multiple of 16 may eventually be violated. This field is of type float (32-bit, ieee-754), allowing integers up to 224 to be specified. The reason for using float rather than what would be the more natural choice, int, is to allow compatibility with the analyze format. The values stored in each voxel can be linearly scaled to different units. The fields float scl_slope and float scl_inter define a slope and an intercept for a linear function. The data scaling feature allows the storage in a wider range than what would be allowed by the datatype. Yet, it is possible to use scaling within the same datatype. Both scaling fields should be ignored for the storage of rgb data. For complex types, it should be applied to both real and imaginary parts. For files that store scalar (non-vector) data, the fields float cal_min and float cal_max determine the intended display range when the image is opened. Voxel values equal or below cal_min should be shown with the smallest colour in the colourscale (typically black in a gray-scale visualisation), and values equal or above cal_max should be shown with the largest colour in the colourscale (typically white). This field, char descrip can contain any text with up to 80 characters. The standard does not specify whether this string needs to be terminated by a null character or not. Presumably, it is up to the application to correctly handle it. A supplementary file, containing extra-information, can be specified in the field char aux_file. This file can, for instance, contain the face indices for meshes which points are stored in the 5th dimension or a look-up-table to display colours. unknown 0 Arbitrary coordinates. Use Method 1.
scanner_anat 1 Scanner-based anatomical coordinates. aligned_anat 2 Coordinates aligned to another file, or to the “truth” (with an arbitrary coordinate center). talairach 3 Coordinates aligned to the Talairach space. mni_152 4 Coordinates aligned to the mni space. In principle, the qform_code (Method 2 below) should contain either 0, 1 or 2, whereas the sform_code (Method 3 below) could contain any of the codes shown in the table. where is the Hadamard product. where is, again, the Hadamard product, and is the qfac value, stored at the otherwise unused pixdim, which should be either -1 or 1. Any different value should be treated as 1. Differently than Method 2, which is supposed to contain a transformation that maps voxel indices to the scanner world coordinates, or to align between two distinct images of the same subject, the Method 3 is used to indicate the transformation to some standard world space, such as the Talairach or mni coordinates, in which case, the coordinate system has its origin (0,0,0) at the anterior comissure of the brain. The char magic field is a “magic” string that declares the file as conforming with the nifti standard. It was placed at the very end of the header to avoid overwriting fields that are needed for the analyze format. Ideally, however, this string should be checked first. It should be 'ni1' (or '6E 69 31 00' in hexadecimal) for .hdr/.img pair, or 'n+1' (or '6E 2B 31 00') for a .nii single file. In the absence of this string, the file should be treated as analyze. Future versions of the nifti format may increment the string to 'n+2', 'n+3', etc. Indeed, as of 2012, a second version is under preparation. The fields char data_type, char db_name, int extents, short session_error and char regular are not used by the nifti format, but were included in the header for compatibility with analyze. The extents should be the integer 16384, and regular should be the character 'r'. The fields int glmin and int glmax specify respectively the minimum and maximum of the entire dataset in the analyze format. 0 Unknown. This code should be avoided. 4 xml extensions used by the afni software package. More than one extension can be present in the same file, each one always starting with the pair esize and ecode, and with its first byte immediately past the last byte of the previous extension. In a single .nii file, the float vox_offset must be set properly so that the imaging data begins only after the end of the last extension. Even though a huge effort was done to keep compatibility with analyze, a crucial aspect was not preserved: the world coordinate system is assumed, in the nifti format, to be ras, which is weird and confusing. The las is a much more logical choice from a medical perspective. Fortunately, since orientation is stored unambiguously, it is possible to later flip the images in the screen at will in most software. The file format still relies too much on the file extension being .nii or on a pair .hdr/.img, rather than much less ambiguous magic strings or numbers. On the other hand, the different magic strings for single file and for file pairs effectively prevent the possibility of file splitting/merging using common operating system tools (such as dd in Linux), as the magic string needs to be changed, even though the header structure remains absolutely identical. The magic string that is present in the header is not placed at the beginning, but near its end, which makes the file virtually unrecognisable outside of the neuroimaging field. The specification of three different coordinate systems, while bringing flexibility, also brought ambiguity, as nowhere in the standard there is information on which should be preferred when more than one is present. Certain software packages explicitly force the qform_code and sform_code to be identical to each other. There is no field specifying a preferred interpolation method when using Methods 2 or 3, even though these methods do allow fractional voxels to be found with the specification of world coordinates. Method 2 allows only rotation and translation, but sometimes, due to all sorts of scanner calibration issues and different kinds of geometric distortion present in different sequences, the coregistration between two images of the same subject may require scaling and shear, which are only provided in Method 3. Method 3 is supposed to inform that the data is aligned to a standard space using an affine transformation. This works perfectly if the data has been previously warped to such a space. Otherwise, the simple alignment of any actual brain from native to standard space cannot be obtained with only linear transformations. To squeeze information while keeping compatibility with the analyze format, some fields had to be mangled into just one byte, such as char dim_info and char xyzt_units, which is not practical and require sub-byte manipulation. The field float vox_offset, directly inherited from the analyze format, should in fact, be an integer. Having it as a float only adds confusion. Not all software packages implement the format exactly in the same way. Vector-based data, for instance, which should be stored in the 5th dimension, is often stored in the 4th, which should be reserved for time. Although this is not a problem with the format itself, but with the use made of it, easy implementation malpractices lead to a dissemination of ambiguous and ill-formed files that eventually cannot be read in other applications as intended by the time of the file creation. The official definition of the nifti format is available as a c header file (nifti1.h) here and mirrored here.